Guitarists & composers Lt. Col. (Ace) Russell Volckmann and Capt. Rick Escobar (aka El Reverbo Capitan of the Woodies) met while performing in different bands at several San Francisco Bay Area shows. Musical styles clicked. Together with keyboardist/ bassist MSgt. Farhan “Mr. Chicken” Mohamed, of Bollywood band fame—and veteran surf bassist Gunnery Sgt. “Big Wave” Dave Becker—the four mercenary marvels later set course on what would be a multi-year operation to create a spectacular musical experience. The quest drew inspiration from legendary 20th century composers/ artists of the 1930s to the 1980s … spanning such genres as Rock, Lounge, Exotica, Jazz, Pop, Surf, Big Band, Swing, Country, Spaghetti Western, Classical, Film Scores, Psychedelia, Middle Eastern, Latin, Hawaiian, and Japanese. The ‘marines enlisted a few great veteran musical conscripts (below) from around the globe (sometimes begging, crying & screaming) to fulfill their noble mission for you. Ann Oyama (Roulette); Nithya Bayya & (Ace) Russell Volckmann (Bongafesti); Vanessa Conteney-Quinones & Enrico Cadillac (Fab Life); Lua Hadar, Marion Benoist, Caroluna Michelson (Te Aa Aerois); Farhan Mohamed & Vidya Venkat (Du’baara). Flute: Howard Cespedes (Fab Life). 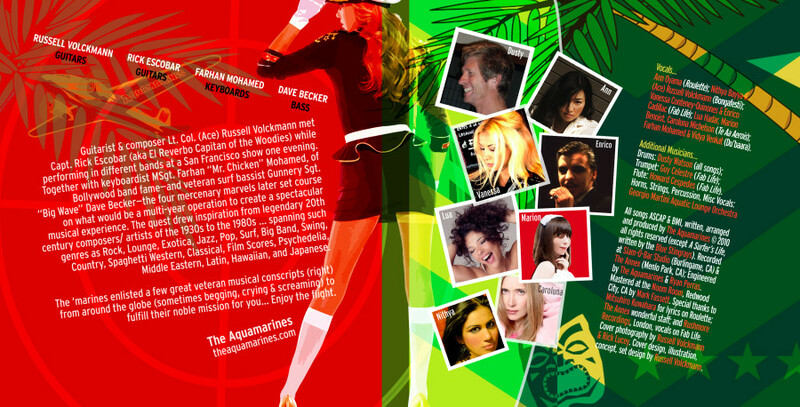 All songs ASCAP & BMI, written, arranged and produced by The Aquamarines © 2010 all rights reserved (except A Surfer’s Life, written by the Blue Stingrays). Recorded at Slam-O-Bar Studio (Burlingame, CA) & The Annex (Menlo Park, CA); Engineered by The Aquamarines & Ryan Perras. Mastered at the Noom Room, Redwood City, CA by Mark Fassett. Special thanks to Mitsuhiro Kuwahara for lyrics on Roulette; The Annex wonderful staff; and Rushmore Recordings, London, vocals on Fab Life. Cover photography by Russell Volckmann & Rick Lucey. Cover design, illustration, concept, set design by Russell Volckmann.